Here is the short version about us. Orleans AutoPro has been part of the Orléans community since 1992 but was operating under different names over the years. In 2002, Orleans AutoPro was born. Part of the NAPA AutoPro family, the largest chain of automotive service providers in north America. Winner of the prestigious JD Powers “Overall Customer Satisfaction Award” 4 times in a row and 5 out of 6 years, AutoPro continues to provide the best client experiences. Orléans AutoPro is independently owned and operated. The Orléans store is Located at 2193 St-Joseph Blvd in Orléans, Ontario. We offer a full-service car and light truck repair and maintenance center. Whether you are looking for tires, rims, a maintenance service including oil change, preventative maintenance, or a major repair, the AutoPro team remains focused on keeping your car younger, longer. Our Mission Statement says it all. 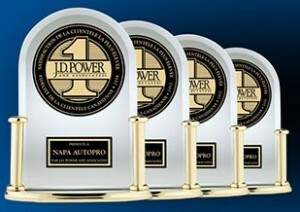 Voted number one in customer satisfaction within the Napa AutoPro family. Find out what it’s like to get real service. Remember: Just because you bought a new car doesn’t mean you have to suffer through (what can be) poor service from your dealer. Your warranty is with your car, and it works as well with us as it does with your dealer. The reality is the dealerships can’t be the only servicing body to maintain the warranty. In fact, dealerships generally operate under a conflict of interest. My AutoPro has created a service that allows our clients to benefit from our service excellence, never void their warranty and best of all, never have to step foot at the dealer ever again. Although we cannot perform the actual warranty work our self. We can set up appointments at dealerships on your behalf, and depending on the time of year, we could deliver the vehicle to the dealer for you. You will also benefit from our Complementary 22 point inspection, Car detailing and Washer fluid fill absolutely free. Now keep in mind that we provide this service for our maintenance clients only. Don’t expect to fly in one day and only do this part of the program. We invest a lot of time, money and manpower to operate this program. Call us or book an appointment online today and find out what it’s like to be a satisfied client. Orleans Autopro is independently owned and operated. Located at 2193 St-Joseph Blvd in Orléans. We are a Full service car and light truck repair and maintenance center. Whether you are looking for brakes, suspension work. tires, and maintenance service including oil change, preventative maintenance, or a major repair, we will take care of all your needs. We're actively involved with social media. We value the comments of our customers. Follow us!